This may be a couple of months after the release of Samsung's new flagship the Galaxy S3 but now all the dust has settled, new firmware releases have ensured stability and we should really check to see if the Galaxy S3 is still regarded as the best device on the market. After 3 weeks of continuous use does the initial gloss of a new handset disappear to reveal a few niggling issues or is the Galaxy S3 really the best Android handset around at the moment? The S2 and S3 together! Let us begin with a brief comparison; before the Galaxy S3 our daily driver was, the equally popular predecessor, the Galaxy S2. Both phones run Android 4.0 ICS and both are power houses, but a good question to consider as we go through the review is if the S3 really is a worthy upgrade to the S2? In a word the answer is a resounding yes! The S3 is faster, sleeker and better in almost every respect! Without physically having the devices side by side you'll be hard pressed to notice the differences, but when they're together the differences are like night and day! "Is the S3 a worthy upgrade to the S2? In a word the answer is a resounding yes!" 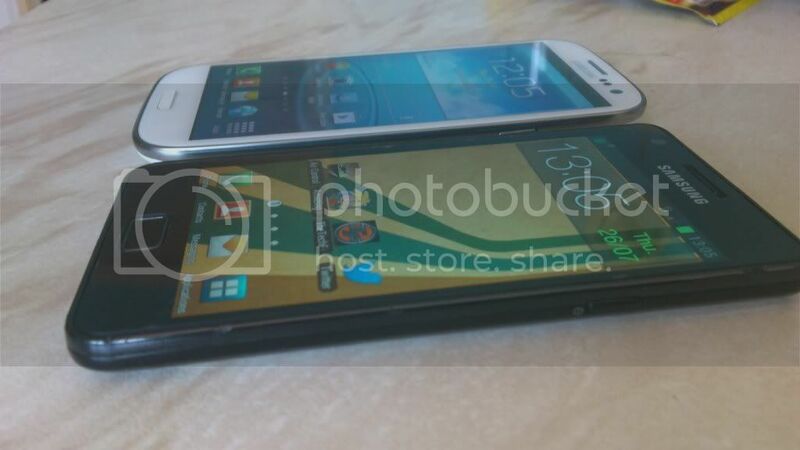 The first change you'll noticed is the difference in size, the S3's screen is just absolutely huge. The extra half an inch difference from the 4.3" to 4.8" is a huge difference and Samsung has done remarkably well to keep the footprint of the Galaxy S3 manageable, despite it being on the large side! But, aside from physical size differences the next advancement you'll notice will be the clarity of the screen. With the Galaxy S2, Samsung used a 480x800 pixel display with Super Amoled Plus technology, whereas the S3 has a 1280x720p Super Amoled display (ie. no Plus). The extra pixels make a world of difference; text on web pages becomes readable even when the page is fully zoomed out, something as simple as this would have required zooming on the S2 to make the text readable. Things like pictures taken on the phones cameras look totally different too, the S3's screen does the pictures justice, demonstrating the quality of the sensor both phones share! Unfortunately, there is one area that the older S2 manages to out shine the S3 and that is outdoor visibility. The Super Amoled Plus display on the S2 appears much brighter outdoors whereas the S3 suffers and is almost invisible in full sunlight. This is quite strange because inside the S3 and S2 appear almost perfectly matched in the brightness stakes, so it's an unfortunate issue, but something you'll quickly get used to again! One other small thing you'll probably notice is that the auto-brightness setting on the S3 will seem slightly darker than you would expect. But, after a few days you'll get used to it, but the screen isn't quite up to the levels of the LCD on the HTC One X, but as long as the pair aren't side by side, you won't really tell. As you can see from the picture to the left the S3's screen does appear brighter in indoor conditions! Despite this minor downer the S3's display is truly fantastic, when my mother was first shown the phone (she didn't know I'd bought it) and she asked if I had a dummy phone, that is a testament to how good it is and sometimes it really doesn't look real, you have to interact with it just to make sure! Performance; software and hardware made for each other! When the Galaxy S3 launched Samsung provided us with everything we wanted; quad-core, 720p screen, 1GB of RAM and lots of Memory options. Thankfully this level of hardware is what phones and tablets deserve, everything absolutely flies. 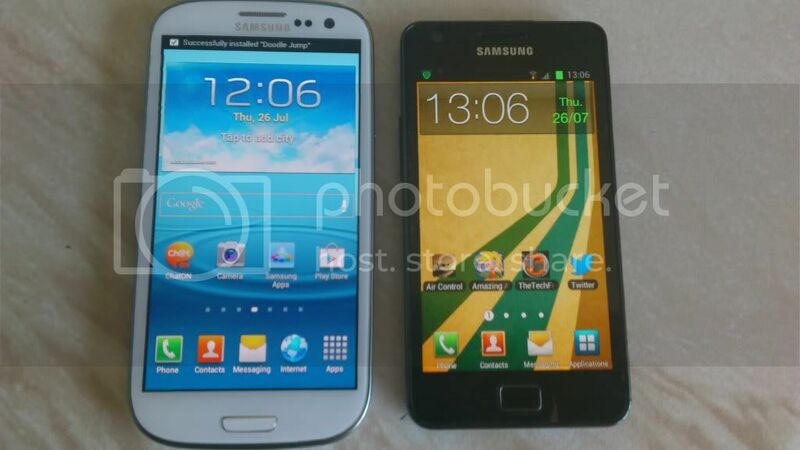 You would think that the Galaxy S2 has great performance until it is compared side by side with the Galaxy S3. The S3 is buttery smooth through every aspect of the user interface. All programmes load next to instantly and there are no complaints at all! You would expect with this demanding processor and huge screen that the battery would be tormented like never before. But, somehow Samsung has managed to squeeze every last drop out of the 2100 MaH battery, which incidentally is NFC enabled and replaceable! To give some examples; if you take the battery all day with texts, browsing, gaming, videos and anything else you can think of to do with your smartphone, then you will be plugging your phone in every night just like normal. But, if you just text, social network and browse lightly you will be able to squeeze two, maybe even three days out of a single charge, something which was completely impossible with any other smartphone which we've ever tested here at TheTechFella. The phone is simply amazing at conserving battery when it's idle and not being taxed too heavily. One thing most people have come to expect from their smartphone is to not have to lug around their point and shoot camera as well, because cameras on smartphones are so good nowadays and again the Galaxy S3 is an imaging champion. The sensor on the back is only an 8MP unit but that doesn't explain how good it is. Pictures are crisp, clear and look great when you get them uploaded to your computer. The most impressive thing is the 'zero shutter lag' which has been banded around a lot recently. It's something which takes some getting used to; as soon as you hit the shoot button the picture is taken, if you blink you literally will miss it, it's really very impressive indeed. The front camera is similarly as potent despite only being 1.9MPs it is capable of 720p video capture and is great for Skype calls and even quick boyfriend/girlfriend together pictures and similar such activities. This is by far and away the best smartphone we've ever had the privilege to test here at TheTechFella. After using the device for 3 weeks it'll be our daily driver for the foreseeable future and given that this phone is cheaper than the iPhone 4S on contract and on pay-as-you-go it's impossible to suggest any other phone at the moment. Although, this might all change with the next iPhone but if you're Android, if you're in the market now, then you have nothing else to think about! Rating: 10/10!!! The device for all comers to challenge in their upcoming 2012 phones!